This recipe was originally intended to use orange zest and orange liqueur, but I do not particularly care for oranges. David said that lemon was ok to use, and my passion for lemon only made the switch all the more appealing. I also used the homemade lemon curd that my mom made the other day, with our lemons of course, as the filling instead of the more traditional jam. These cookies fully lived up to my expectations. They were tart and crunchy but light enough that I could eat a couple without any guilt. They would be equally delicious filled with a number of other things, jam or even a chocolate ganache, and they could be adapted to any citrus fruit that suits you. These cookies would be a lovely accompaniment to a nice cup of earl grey tea. Cream butter and sugar. Stir in egg yolk, citrus zest, vanilla, and Grand Marnier. Preheat oven to 350. Divide dough into two pieces. On a lightly floured suface, roll out dough to 1/2-inch thick. Use a 2-inch round cookie cutter to cut out circles of dough. Place on a parchment-lined baking sheet. Roll out the other piece of dough, cut out the same number of cookies, and cut a small hole in the center of each one with a round 1/2-inch piping tip. Gather up scraps of dough left behind, roll out again, and cut additional circles, half with holes, half without. Bake for 12 minutes, rotating halfway through. Cool completely. 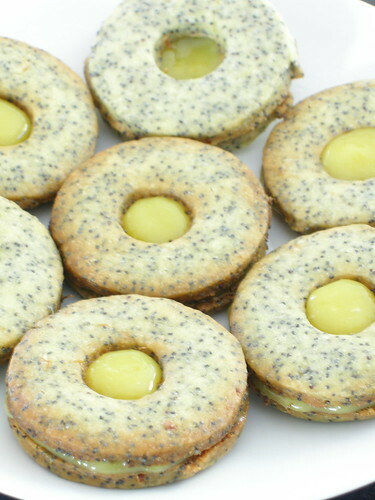 Spread 1 teaspoon lemon curd on the flat bottom side of cookies without holes in them. 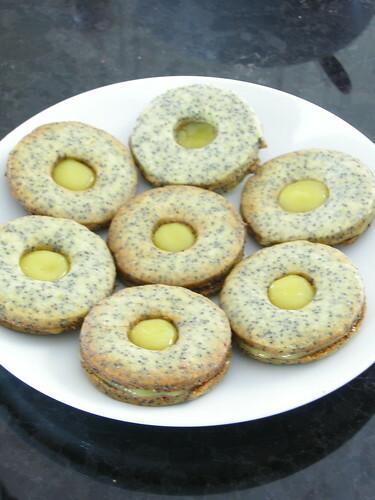 Top with cookies with holes, bottom side down.